Roofers are the people who literally keep a roof over our heads. These workers install and repair the roofs of buildings to keep interiors dry and safe. Roofers take detailed measurements to calculate materials needed. They lay down layers of materials to create a lasting roof cover– starting with a vapor barrier, and the roofing material a client chooses, such as asphalt, traditional— or newer solar shingles, or long-lasting metal. Weatherproofing the seals around chimneys, vents, or other rooftop elements requires precision and spatial perception. Roofer helpers set ladders and scaffolds in place, and hoist or carry materials to roofs. 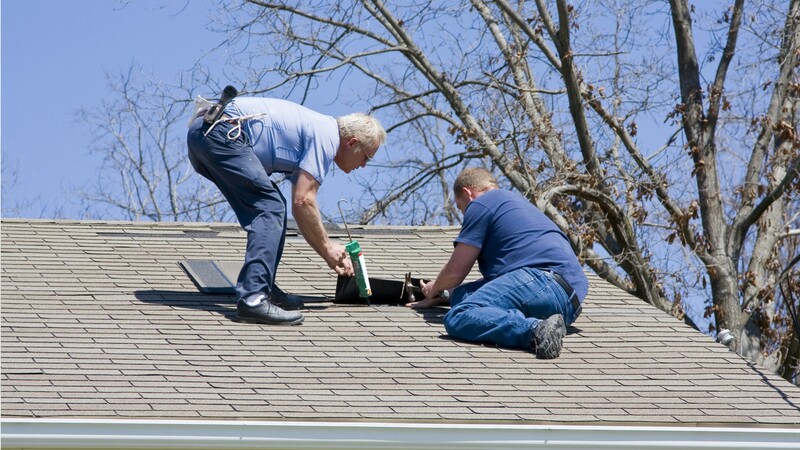 They remove old roofing material, and assist roofers with roof installation and repairs. They also clean the work area and equipment. Roofing work is physically demanding. It involves heavy lifting, as well as climbing, bending, and kneeling, often in very hot weather. Roofers work outdoors in all types of weather, and need to be comfortable working high above the ground. Most roofers work full time— although only seasonally in colder climates— and may work overtime to complete jobs quickly, especially when rain is expected. Most roofers and helpers work in crews for roofing contractors. Roofers and helpers usually learn on the job, though some roofers learn their trade through an apprenticeship— typically a 3-year program of technical training and paid on the job training. Helpers--Roofers by U.S. Department of Labor, Employment and Training Administration is licensed under a Creative Commons Attribution 4.0 International License.